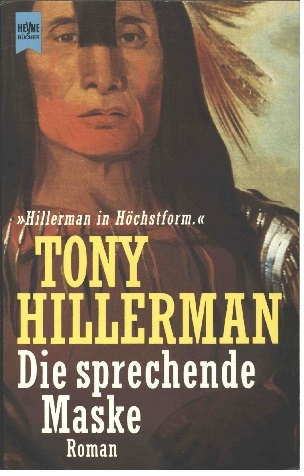 One of my first tasks on the Hillerman Portal was to describe the covers of the foreign editions of the Tony Hillerman novels. This was a fascinating time, because each cover depicted what the publisher and jacket designer imagined the book to be about, a visual representation of an imagined mythology of the American Southwest and its indigenous cultures. While some covers were abstract images of plot points, like a suitcase filled with cocaine set in a landscape that referenced either the Grand Canyon or a saguaro forest, many foreign editions merely had images of Native Americans. However, the images chosen or created for these covers were often of Plains Native Americans. This choice at first seemed odd, considering the novels are set in the Southwest and feature either Navajo or Pueblo Native Americans. However, the reason for using the image of Plains Native Americans seems to be simple: the jacket designer selected an image that was understood to be the general public’s “archetype” or “stereotype” of what a Native American looks like. During this process of discovery, one book cover in particular caught my attention, the cover of the 1992 German edition of Talking God (http://ehillerman.unm.edu/node/454/ ). The image is of a stoic Native American man with a red painted face and feathers in his hair. The copyright page of the novel explained that the image was a reproduction of an oil painting of a Plains Indian, with no named artist. Further research revealed that the oil painting was a portrait of a native warrior named Buffalo Bull's Back Fat (In Blackfoot: Stu-mick-o-súcks), the head war chief of the Blood Indians, and was painted by the famous painter George Catlin in 1832. The Blood Indians, also known as the Kainai Nation, are a First Nation band that inhabit the southern portion of Alberta, Canada and are one of three nations comprising the Blackfoot Confederacy. This confederacy includes the Kainai Nation (Bloods), Piegan Blackfeet, and Siksikáwa (Blackfoot). This reveal struck a chord in me, something that resonated in the research I had previously conducted on Hillerman’s novel Talking God. I had encountered a newspaper article in Hillerman’s research folder that mentioned the Smithsonian returning human remains to the Blackfeet in Montana in 1988. While the Blackfeet were not mentioned by name in Talking God, Hillerman does begin the novel with the Smithsonian repatriating human remains to a tribe. Perhaps then, George Catlin’s Buffalo Bull's Back Fat oil painting was not an inappropriate choice as cover art for Talking God, because by some strange accident the painting’s subject ended up being implicitly connected to the novel’s subject, even though it was selected because it looked appropriately “native” to German readers.